Check your map to avoid the 13' tunnel on the way to casino. 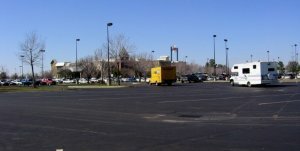 Large parking area, mostly level. Security car patrols area at night. Have visited many casinos near water, never one as musty smelling as this one. Play areas and restrooms not kept clean. Payouts are pretty low, if you get one at all. Atmosphere is a bit depressing. Not a lot of food choices, however the free beverage station is very nice with good selection.